The following thread appeared in the forum, pointing out that the current drawn through the VB pin (RTC battery back up pin) was observed to be a lot higher than expected. Specifically, the report was 175uA, whereas the datasheet for the LPC1768 suggests it should be around 27uA. The first experiment was to make some measurements of my own to confirm what was being seen. I connected the VB pin of my mbed to 3.3v supply via 1k resistor, as the original poster had. This gives me a drop of 1mV per uA, so at the reported 175uA I should be seeing 175mV drop across the resistor - easily enough to measure. This was nearly twice the figures seen by the original poster! Seeing the numbers above triggered a little investigation. The original mbed design was based on the LPC2368, and very little changed on the design when we moved to the LPC1768, as it was essentially a pin for pin replacement. On the LPC2368, the RTC was powered completely separately. If the RTC was required, Vbat had to be powered, either from the main 3.3v supply, or a battery. Not wanting to run down a battery uneccessarily, a pair of ultra low Vf diodes were put on the board. Expecting a 3.0v coin cell to be used, the arrangement would allow the RTC to be powered from the main 3.3v supply while it was present, and then switch to the 3v battery when the main supply was removed. The part of the circuit in question is shown below. The side effect of this is that when the main power is removed, current will leak through D3 and sink into the rest of the circuit. This isnt enough to power it, but it is enough to notice a significant increase on the expected 27uA. However, in the newer LPC1768 design this power switching is now built into the MCU itself. If power to the rest of the device is present the RTC will select the main supply to conserve the battery. When the main supply is not present, the RTC will source from the Vbat pin. Essentially, the diode circuit above is no longer needed. For someone using the mbed NXP LPC1768 and wanting back up the RTC with a coin cell, the easiest fix is to simply remove D3. This will mean there is no path to leak current from the battery back to the main supply rail. 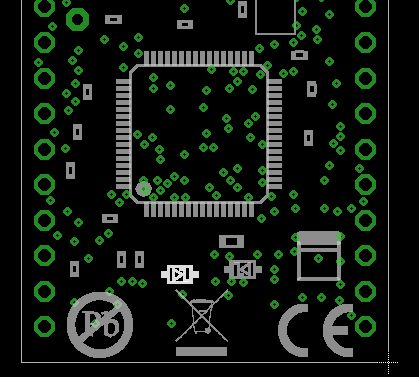 Taking a look at the UNDERSIDE of the PCB, D3 is near the at the bottom, and is the diode closest to the "Pb" symbol, highlighted in bright white. On future build of mbed this diode will not be fitted at the manufacturing stage, For now, it can be easily removed if you are confident with a soldering iron. After Sucessfully removing D3, it is time to check the result. 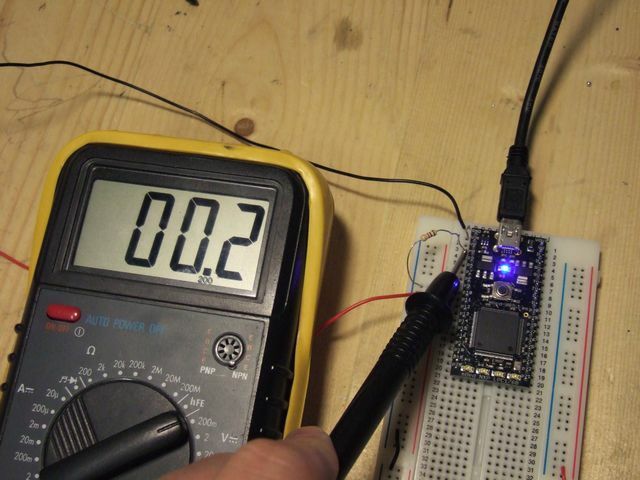 Using the same test circuit, a 1k resistor to give 1mV per micrcoamp, we measure the current drawn through VB both with and without the USB power plugged in. 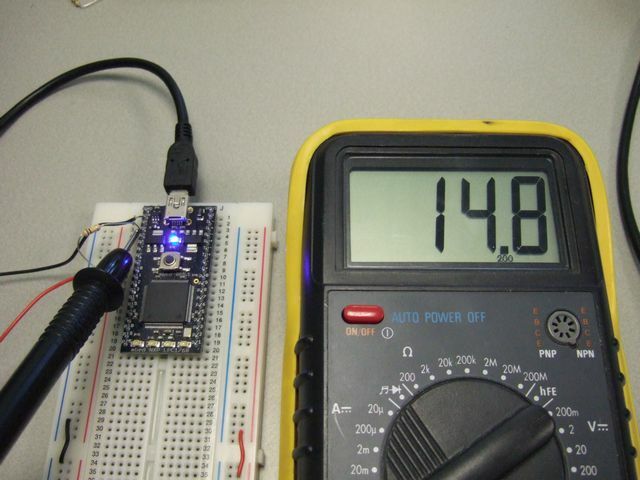 With USB power applied the current draw is down to 20uA, and this goes up to 40uA when USB power is removed. For now this is massive saving, but some further investigation with some higher accuracy measurements is needed. function In the mean time, it is necessary to check the function of the RTC. I wrote a very simple test program to set the RTC, then print it's value over USB to a terminal in a loop. Run the program with no power attached, and ensure that the RTC was actually powered and running by observing the output on Hyperterm. Plug USB back in, and observe RTC still running, and with a correct value. So it seems that upping the sensitivity of the reading has made us converge on the figures, which are 1.4uA when the LPC1768 is powered, and 4.3uA from the battery. This is still a lot higher than the 0.8uA quoted in the NXP datasheet, but in the abscence of high precision, high sensitivity measuring equipment, the measurements are enough to satisfy us that we can expect a long backup time from a coin cell. Taking another look at the circuit diagram, you'll spot that a second diode was needed inthe original circuit. With D3 removed, D4 no longer needs to be a diode, but it is doing any harm? The assessment here is that it is not necessary to have a diode there, and in the future, we may be able to fit D4 with a zero ohm link. In the mean time, the effect of the diode is that the Vbat pin of the LPC1768 is being supplied at one diode drop below VB. Looking at the If vs Vf graph on page 3, at 25^C which I take as room teperature, a forward current of 30uA (3 x 10^-5) we can expect a Vf of less than 100mV, I read it as about 30mV. So while the diode isn't necessary, it appears from the datasheet that it isnt doing any harm. The higher than expected current drain through Vb is due to leakage in a circuit that was neccessary for the LPC2368 mbed, but it no longer needed withthe LPC1768. Future mbed builds will not have this diode fitted, but for those who wish to reduce thier Vb consumption and are competant with a soldering iron, it is a fairly straight forward operation. I looked at the drawing and the board and was puzzled for a while before I realized I should look at the bottom of the board. You might want to mention that. Chris, Thanks for this nice writeup! I did the rework you propose to my 1768 board. 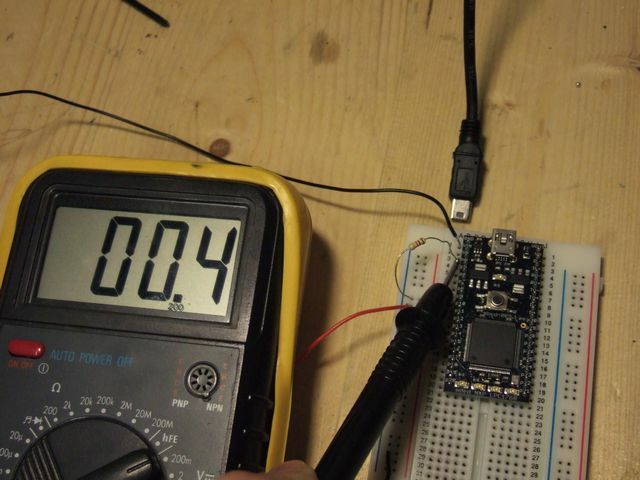 I checked if RTC keeps time after diode removal using my pub_iva2k_ethsntp, and it does. Interesting... for my MBED the VB current dropped from 290mA down to 0.5uA @ 3.00V after I removed D3. 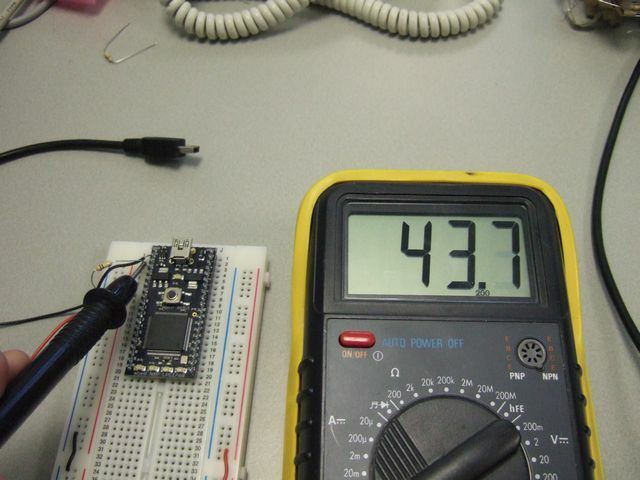 I was near a bench and used Keithley 2000 (7-digit DMM) in DCI mode instead of a series resistor. 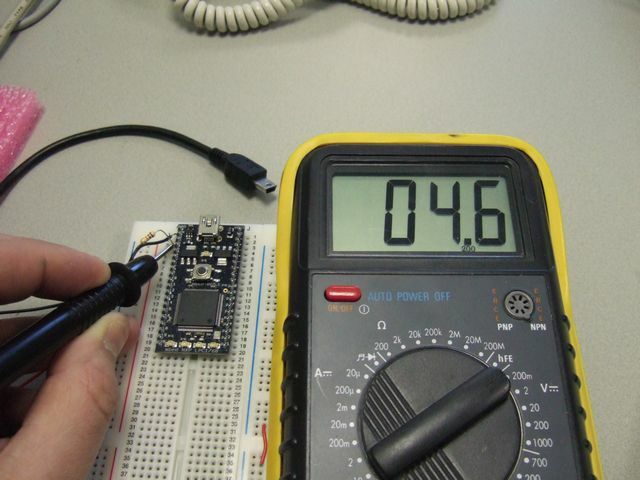 Expecting a higher value, I looked up NXP datasheet, and there it says 0.8uA typ and <0.8typ without other power (see page 41 of http://www.nxp.com/documents/data_sheet/LPC1768_66_65_64.pdf), so my current is on the lower side, but not that much off (NXP does not state min or max). I wonder what is causing this really high reading (10, 20 and 40uA) for you? Good point. I have updated the text to make it clear. I might add a picture too! I removed D3 on my mbed and the battery current dropped to 0.2µA with power on and 0.6µA with power off. 5. Apply soldering iron to other pad of D3. 6. Lift D3 off mbed. Not all mbed users will have the means or the ability to remove D3. Are you going to do the decent thing and offer a free D3 removal service to such users? goodwork, but you have nottaken into account that you need to raise the "battery" voltage, up untill you have 3 Volts on the mico! 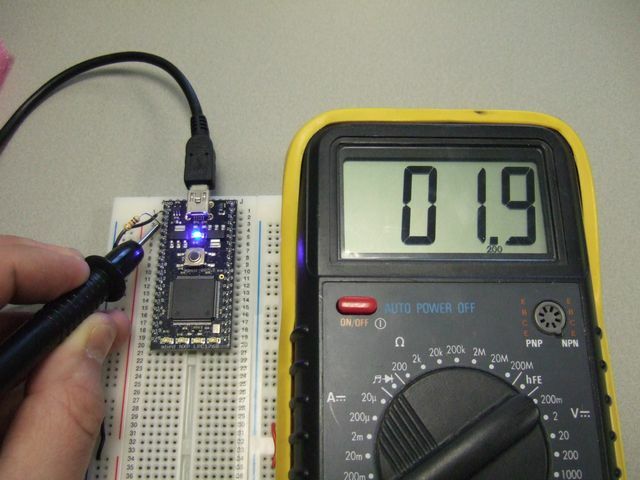 if youdrop 100mV accross the resistor, then the effective voltage on the pin is 2.9 Volts, which will probably draw more current. Is this diode removed in mbed-005.1 version? Thanks. Yes, this diode is no longer fitted in production. However, depending on when you bought your mbed, and how long the stock had been on the shelf where you bough it from, you might still have one with a diode. 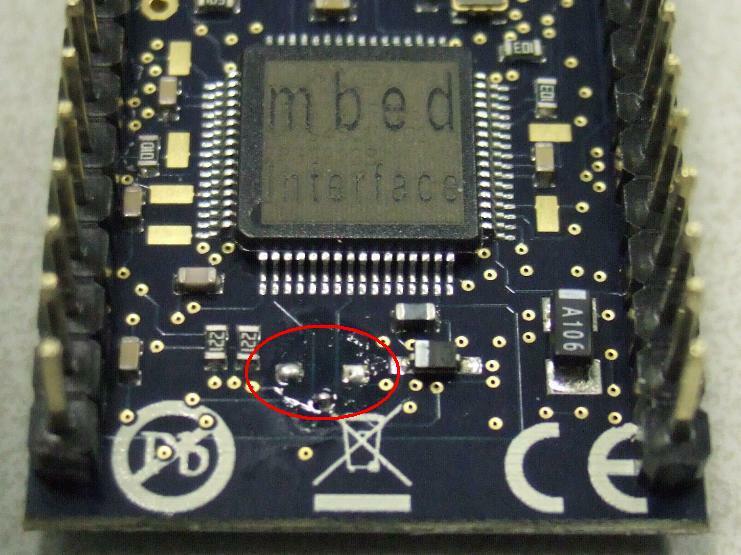 If you have a look on the underside of your mbed at the bottom, you should be able to verify if you have a diode or not. Where do the clock for the rtc on the mbed comes from? It seems from the schematic as the 32.768hz xtal is not connected to it. You said : "when the main power is removed, current will leak through D3 and sink into the rest of the circuit"
However looking on that schematic, when main power it's removed, than anode of D3 it's connected to ground , then diode isn't conducting at all . On datasheet diode reverse voltage it's 10V. Doesn't says either that would be a kind of shottky diode or a avalanche diode.